Why should the 19 million acres of wilderness that make up the Arctic National Wildlife Refuge, the potential oil beneath it, and its resident herd of caribou, matter at all to the ski industry? Sure, the refuge in Alaska is wild and beautiful, it’s pristine, it’s a crown jewel of wilderness. We in the ski industry fancy ourselves environmentally conscious, so we should want to protect it. But that’s abstract, and it could even be disingenuous. Do we support protection because we want to paint ourselves green, taking a stand where we have nothing to lose? But there is a compelling reason that the ski industry should care deeply about the Arctic Refuge, and it isn’t just about caribou, and it’s not just about wilderness. It’s about energy policy. Energy policy decisions threaten to bring the ski industry to its knees. Overwhelming research is showing that climate change is more than hypothetical, it is happening, and humans — largely by virtue of our energy choices — are responsible. Last August, Science magazine declared a consensus on climate change, after reviewing 928 papers and finding that they all agreed that the earth was heating up and humans were responsible. Whenever I say things like this, I get rafts of mail telling me I’m wrong. My response is that, for now, I’ll side with groups like the National Academy of Sciences and the vast bulk of climatologists. By deciding to drill in the Arctic Refuge, we’re saying we’re unwilling to take any additional steps, no matter how modest, to reduce our dependence on oil, steps that would coincidentally address the greenhouse warming problem and improve national security. As Amory Lovins put it: "When you’re addicted to drugs, you’re told to cut off the supply. But when you’re addicted to oil, you try to find more." By drilling in Alaska, are we then saying that we’re willing to pursue an energy "strategy" that threatens the ski industry and the future viability of people’s lives, communities and children, because we don’t want — for example — to increase automobile fuel efficiency standards by a few painless miles per gallon? Well, yes, that is exactly what we’re saying. 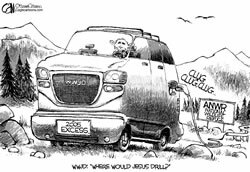 With the climate changing and threatening not just skiing but every industry, the federal government has not been willing to order cars to go farther on a gallon of gas. The government is also not willing to make energy more expensive when it pollutes, nor to encourage with incentives what we need more of, which is a greater dependence on renewable energy sources and energy efficiency. Even though between 1979 and 1986, we saved an Arctic Refuge’s (predicted) annual output of oil every five months with efficiency standards that didn’t ruin our economy, we’re getting ready to drill. We’ll drill in Alaska, even though, as Bill McKibben points out in Orion Magazine, the most optimistic estimates assume that the Arctic Refuge can supply the U.S. with only about five months of oil. Fortunately, not all of our leaders have their heads in the sand. Colorado Sen. Ken Salazar, D, understands the impact of energy policy on the state’s economy, and he opposed drilling in the Arctic Refuge. Sen. Wayne Allard, R-Colo., who doesn’t link the future of Colorado’s recreation industry to decisions made in Alaska, supported drilling and a policy of unmitigated consumption. Decisions like drilling in the Arctic are part of a broad national policy that, if continued, will make skiing impossible for future generations. So this isn’t just about the caribou. It’s about how we’re selling out our children by ruining their chances for the kind of prosperity we enjoyed. It’s about how we’re selling out our industry and all the other aspects of the West’s ski tourism economy — now a $2 billion money-maker in Colorado alone — because we’re too lazy or arrogant to make any sacrifice at all, even the relatively painless ones. Protecting the Arctic Refuge isn’t just about the Arctic Refuge; it’s about skiing. Pat O’Donnell is president and chief operating officer of the Aspen Skiing Company.